Hardcover pamphlet binding. It really is my favorite to make. 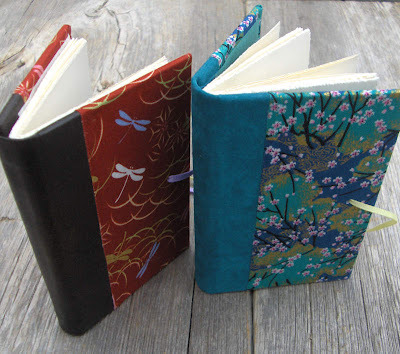 Two small notebooks with Japanese fabric on the covers, and leather spines. 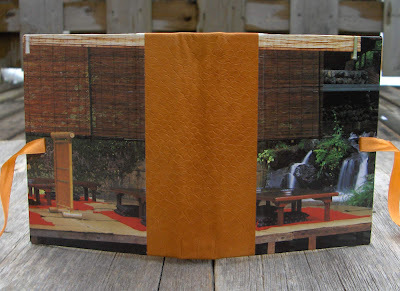 This one has an orange leather spine and a photograph of a tranquil Japanese scene on the covers: lots of bamboo screens and low tables and a waterfall in the background. This book has mixed papers for the pages, similar to the next three shown here. These three books all have fabric on the covers that I have backed with mulberry paper to make book cloth. The blue and pink books have book cloth on their spines; the black & white book has a leather spine. These books also have mixed papers inside including handmade papers, cardstock, plain and lined papers, decorative papers, and even some illustrations salvaged from an old story book that was falling apart. Gorgeous! I love my journal I got from you and the earrings!! You do such awesome work!